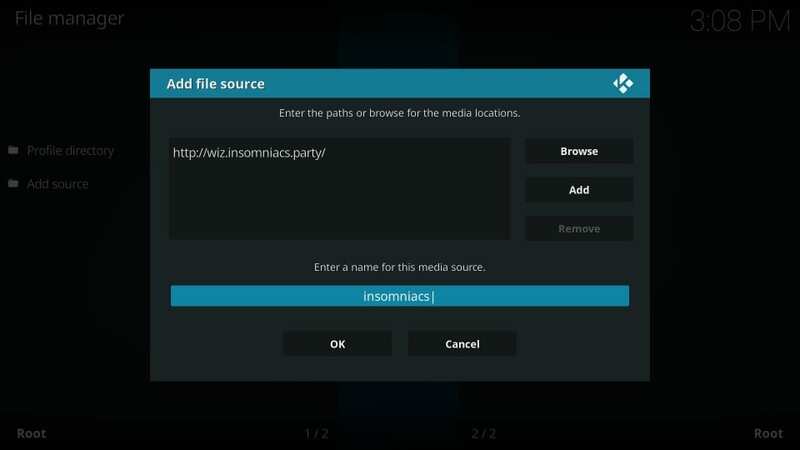 In this Tutorial, I will show you how to install Insomniacs Builds on Kodi 18.1 Leia, Kodi 17.6 Krypton. 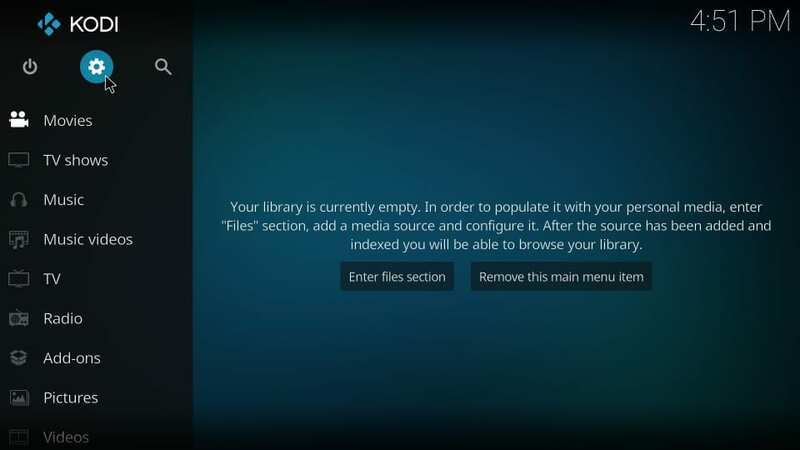 The instructions provided here work on all the Kodi compatible devices. 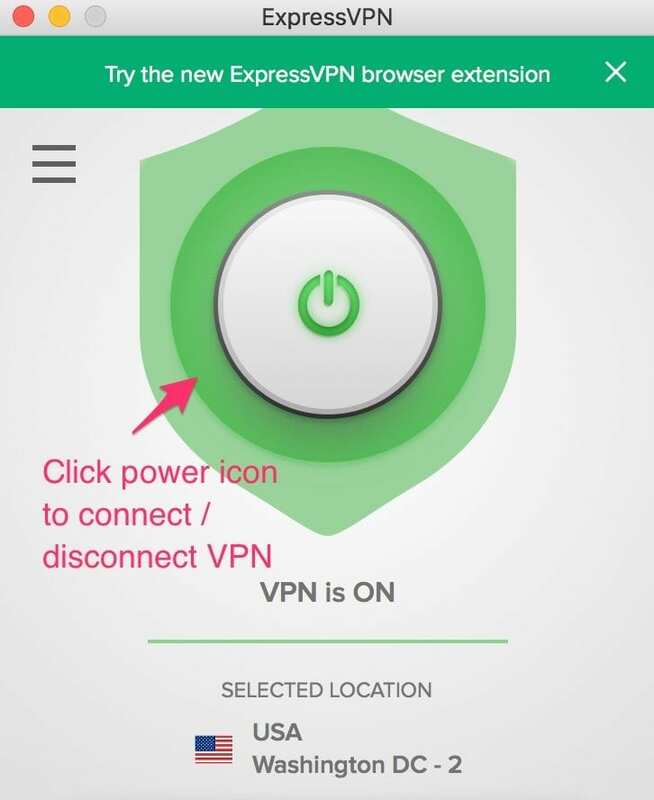 You can install this build on FireStick, Fire TV, Fire TV Cube, Mac & Windows, Android Mobiles, Android TVs and Boxes and more. 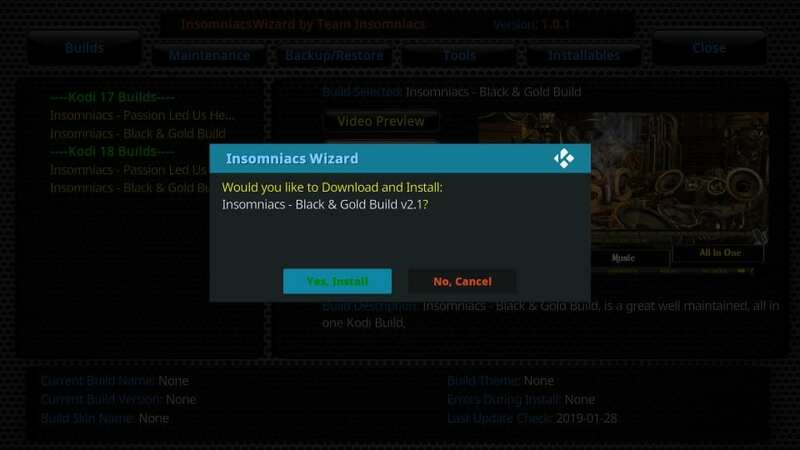 Team Insomniacs brings to you a couple of builds you can try on Kodi. This Wizard hosts two builds as I write this guide. Black & Gold Build is my personal favorite. That’s why I will use it for demonstration purposes here. However, you can pick any other build you like from this catalog. Let’s get started. 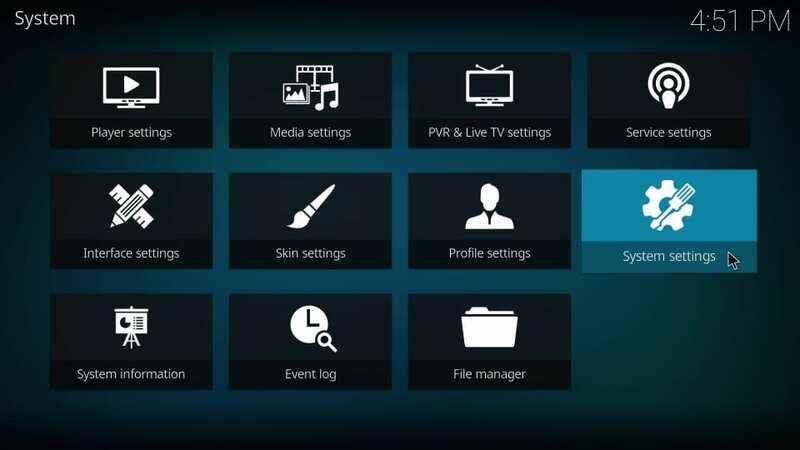 Note: Even though Kodi 17.6 can still be used and the following screenshots have been taken from 17.6, I recommend updating Kodi to the latest version. 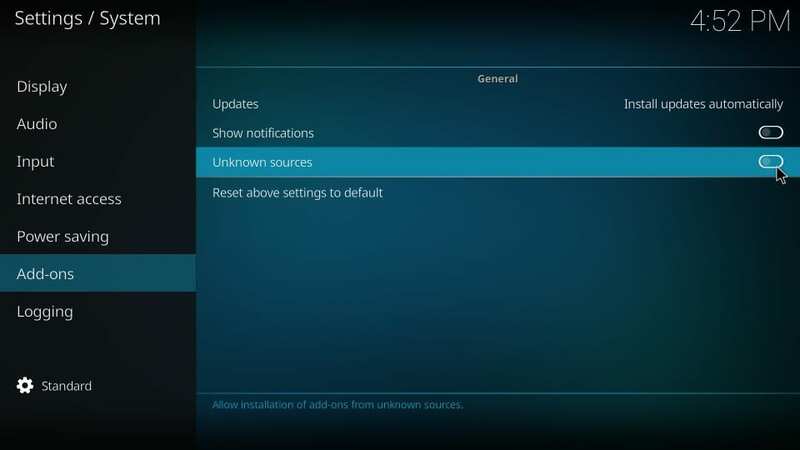 #2: Now click System settings on the screen that opens next. 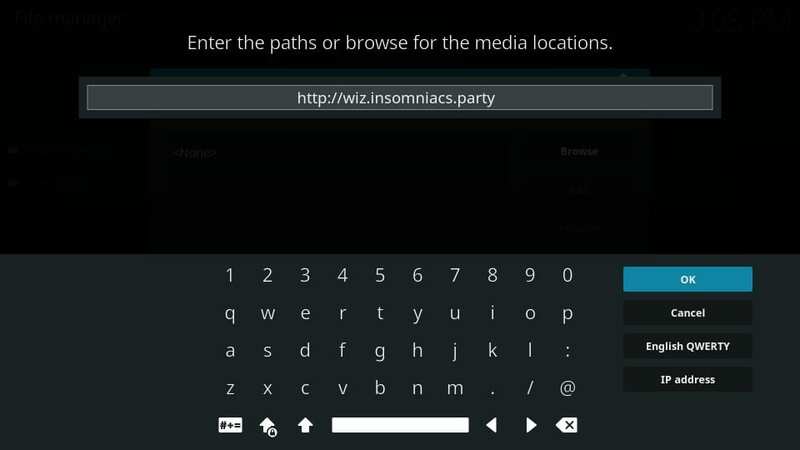 By doing this, you allow Kodi to install the Insomniacs Kodi builds. Let’s get started now. 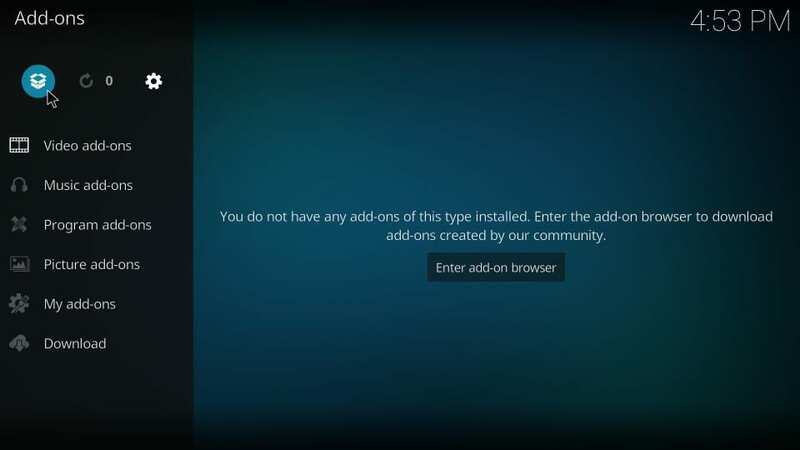 I am now going to take you through the step by step process to install this build. There are a lot of steps involved. 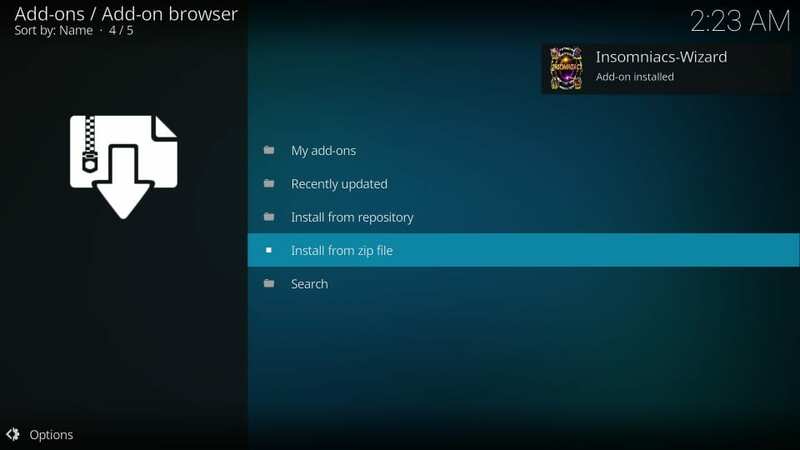 However, if you follow them carefully, and in the order I have laid them out, you will have one of the Insomniacs builds on Kodi in a few minutes. We will now get started without any further ado. #6: You will now return to this window. You need to name the source now by highlighting the marked field Enter a name for this media source. You can choose any name you want to identify this source with, in one of the steps later. 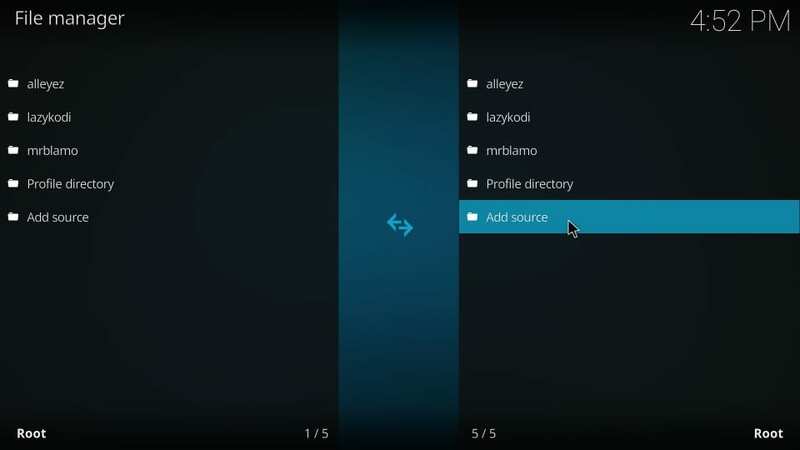 That is how you add the source or the path to the source to Kodi. We now go to the next part. 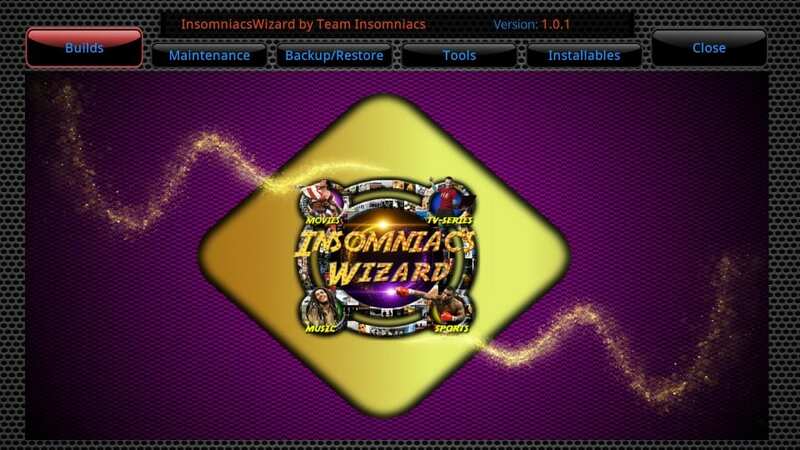 #6: Wait for the notification saying Insomniacs-Wizard Add-on installed. This could take more than a minute. 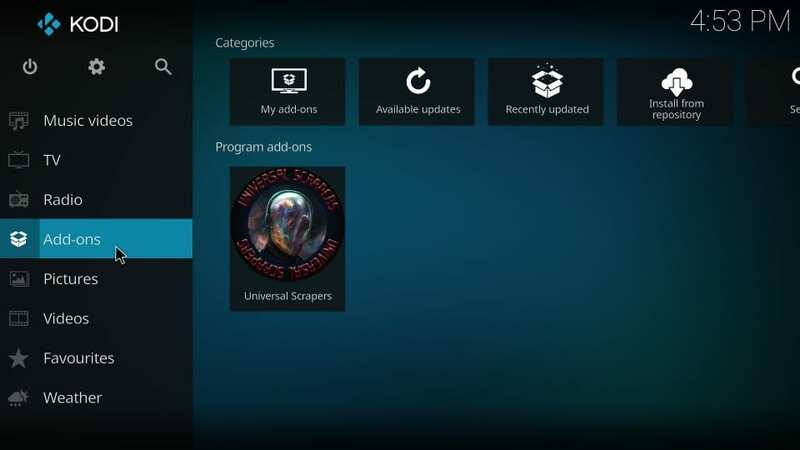 Note: When the wizard is being installed, Kodi does not show any activity. But, don’t worry, the installation takes place in the background. Just be patient and wait for the confirmation. #9: On the third one, click Ignore. 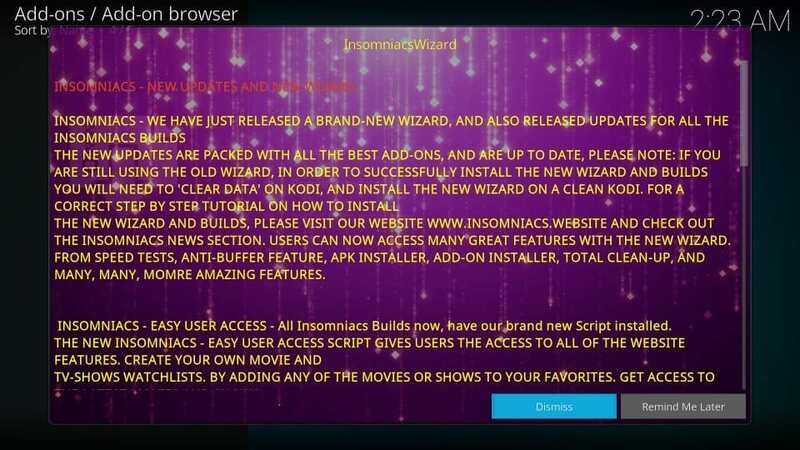 You have successfully installed the Insomniacs Wizard. You are all set to go. #3: Click Program add-ons on the next window. 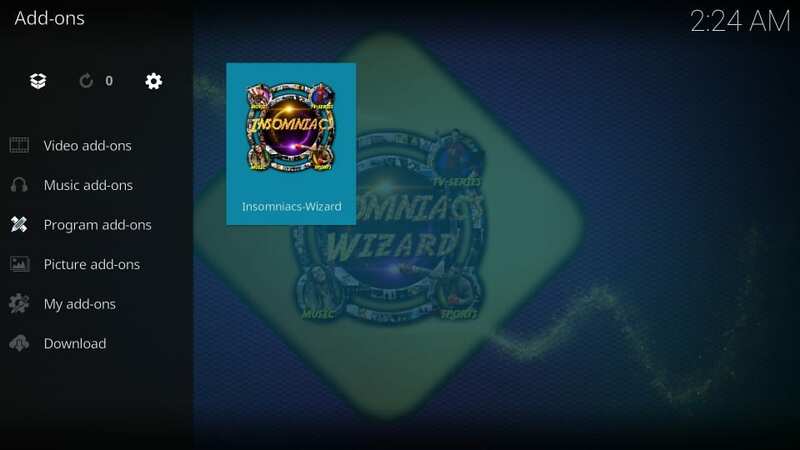 Click the Insomniacs-Wizard icon when you see it. 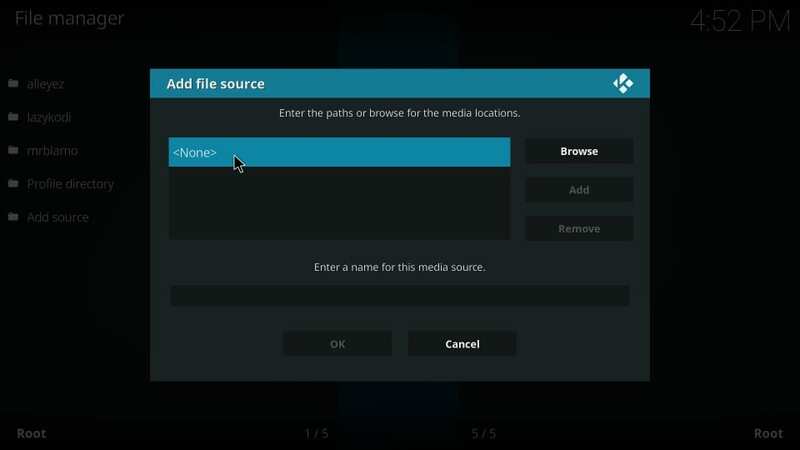 Kodi 18.1: You will see a different interface. Click Builds option. #8: Wait for the build to install. The build will first download the data and then install. It takes 3-4 minutes. That’s it! 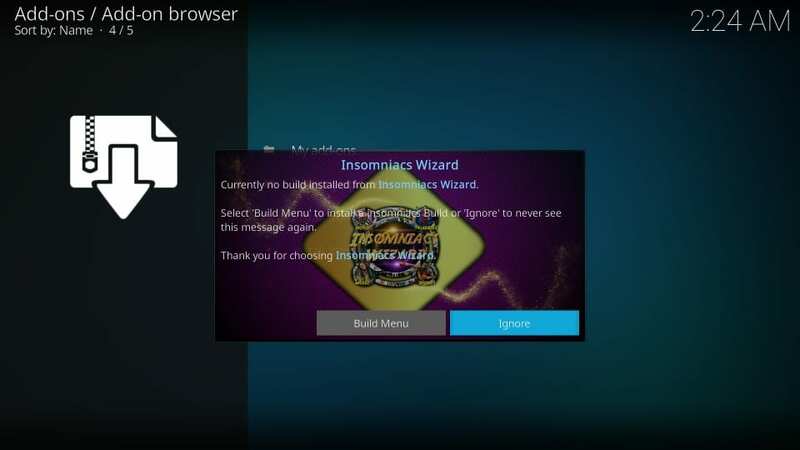 You have successfully installed the Insomniacs build on Kodi. 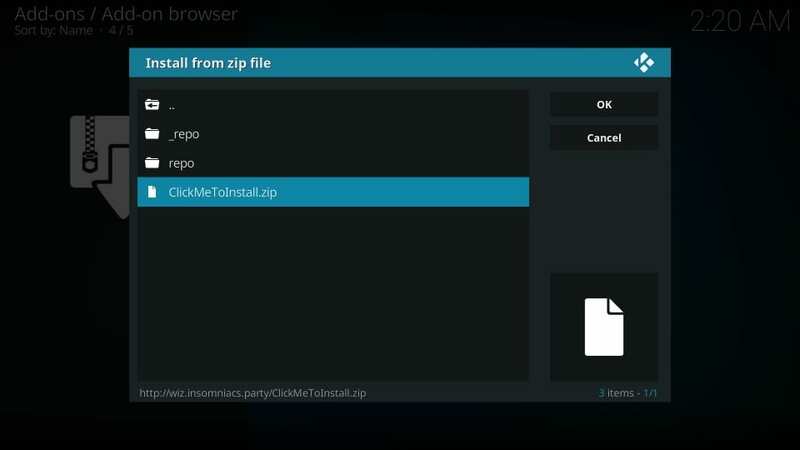 Now simply go ahead and restart Kodi for the build to take effect. 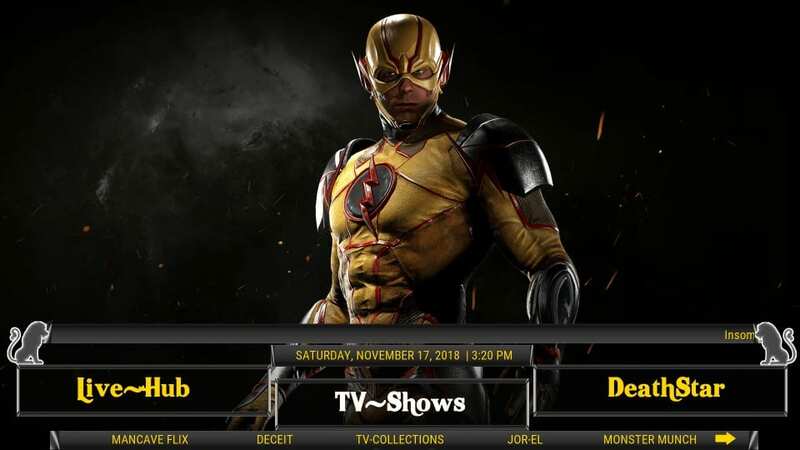 Let me quickly introduce you to the Black and Gold Kodi Build. As the name gives it away, the build’s theme uses the black and gold colors predominantly. That’s also evident from the image of the home-screen of the build I have enclosed below. Even though I personally like straighter fonts, the visuals of this build appeal to me. The interface is tidy and free of any clutters. The fonts are big, allowing easy legibility. The build features a standard layout of Main Menu bar and Submenu bar put together across the width of the build. The build also features special categories like One-Click. 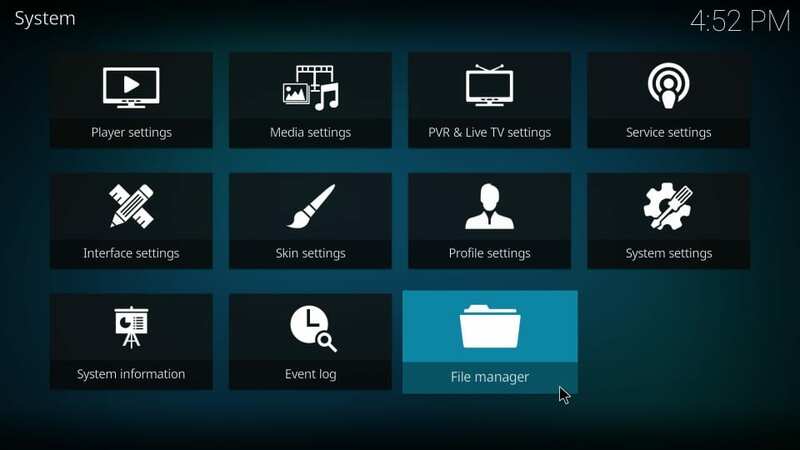 This section gives you access to the video addons that play one-click movies and shows. You don’t have to wait for the streaming links to load up. The all-on-one addons The Magic Dragon and DeathStar also find their separate categories on the home-screen. The build offers a good line-up of addons including Deceit, DeathStar, The Magic Dragon, Exodus Redux, SportsDevil, Fladnag Addons, Monster Munch, Just Sports, and many more. Meaning, there is hours and hours of streaming available at your disposal. 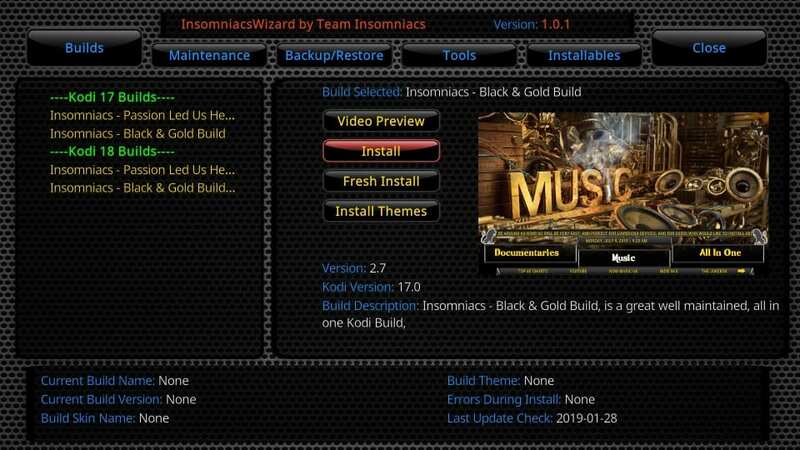 Team Insomniacs offers us a small, but solid collection of Kodi builds. The Black & Gold Build I have used in this guide is the best in my opinion. This build is neither too heavy to cause any performance issues nor too light to miss out on important features and addons. 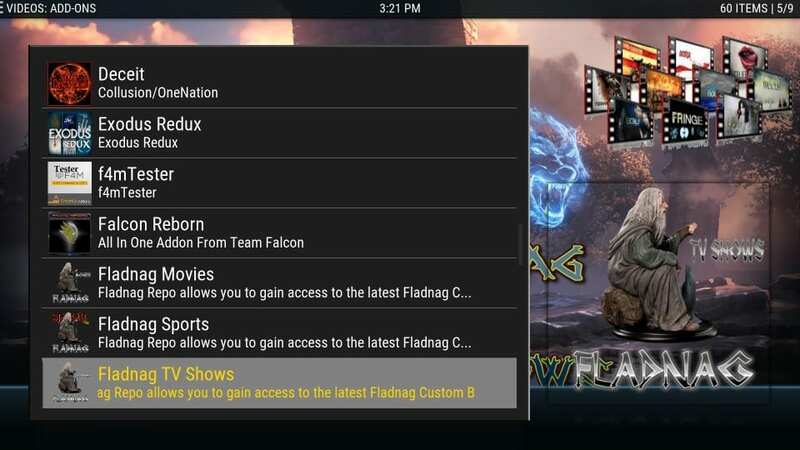 I have tried Black and Gold Build on FireStick and Android Box. It works pleasantly even on these moderately equipped devices. It performs even better on Windows and Mac computers. The key lies in allowing the build to update its addon, skins on the first run. The build also packs every addon I use for on-demand entertainment (movies and shows). Live TV department isn’t all that great. 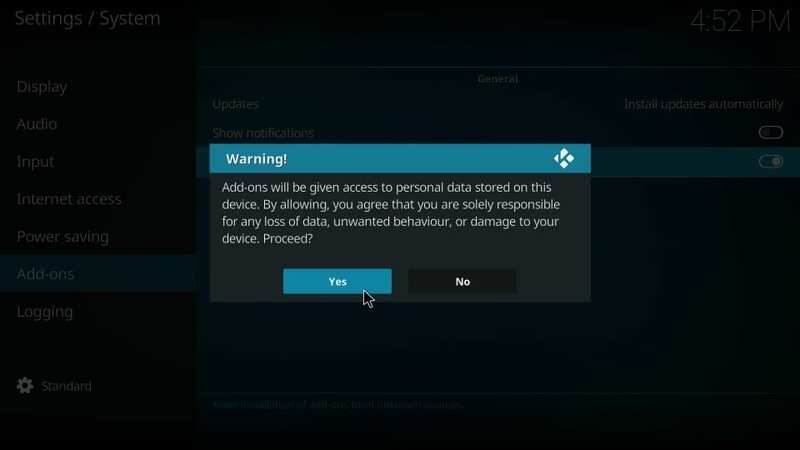 But, you may install third-party addons to make it better. 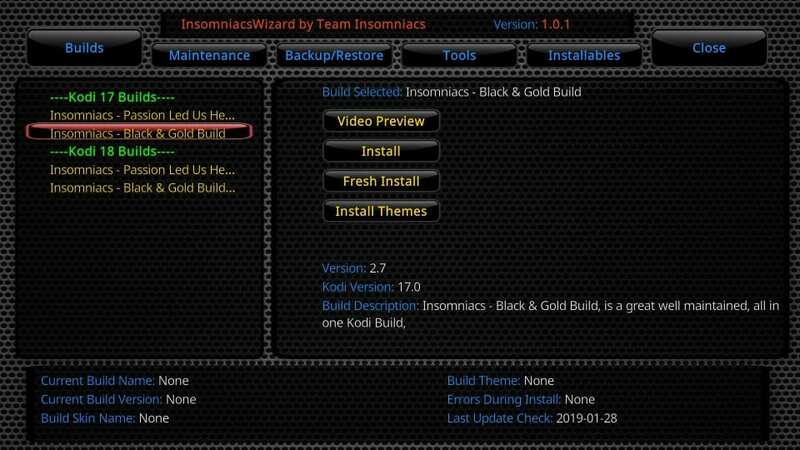 All in all, Black & Gold is a solid build and one of the reasons why Insomniacs Builds are now the part of our Best Kodi Builds list.